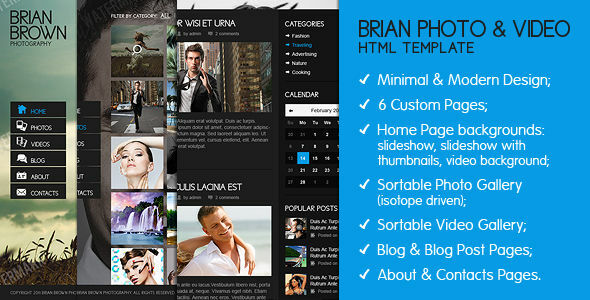 Brian Photo and Video HTML Template represents innovative approach to how stylish and modern websites are built. Whether you are going to maintain video or photo gallery, this template has got you covered. It will be great for photographers, webmasters, creative agencies, portfolios, design groups and other exclusive projects. There are three background variations on the Home page: slideshow, slideshow with thumbnails, and video background. Each inner page (except Home) features its own fullscreen background picture (configured individually for each page via HTML code). Brian Template is capable to host unlimited number of images and external videos. Both galleries are powered by isotope filter. The site comes with functional Ajax contact form.